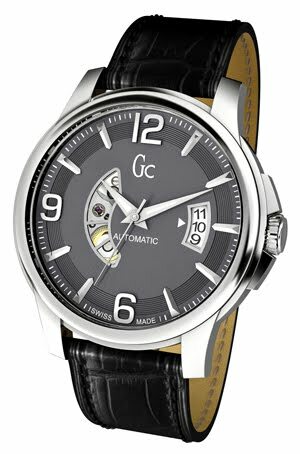 With the Gc Classica Automatic, Gc expands its offering of Swiss Made mechanical timepieces for gentlemen and makes it an integral part of the Gc Classic Collection. The elegant masculine timepiece smartly combines Swiss watch making savoir-faire, dedicated craftsmanship with attention to detail and a classic yet contemporary design with vintage style elements. The Swiss automatic movement (SW 200-1) can be admired through a refined crescent shaped dial opening between 6 and 9 as well as through its transparent case back. The Gc Classica Automatic is a sophisticated mechanical timepiece offering both contemporary appeal and distinct style, yet remaining true to Swiss Made watchmaking values. The elegant round case with a 42 mm diameter acts as a perfect frame to the sophisticated details of the dial. Inspired by vintage timepieces, the raised arrow-head indices, large Arab numbers and classical hands, coated with SuperLuminova®, and the soft sunray textured dial contribute to the retro-classic allure of the watch. The intriguing cut-off crescent shaped dial-opening at 9 is the distinctive feature of this classical timepieces and is balanced by a wide turning date wheel window at 3 o’clock. In addition this automatic timepiece is equipped with a finely chiseled screw-down crown with embossed Gc logo, screw-in exhibition case back with transparent sapphire coated crystal as well as an anti-glare scratch resistant sapphire crystal. The watch offers a water resistance up to 100 meters (10ATM). The Gc Classica Automatic is available in a variety of different colours and material combinations ranging from polished, brushed, black PVD coated or rose gold PVD accentuated 316L stainless steel cases combined with soft croco-embossed Italian leather straps with deployment buckle or a smooth stainless steel bracelet with a two-side pusher deployment buckle. A true Smart Luxury statement of Swiss savoir-faire and expressive European design.